Cafe Chill, Brooklyn, 2013. 1/200 sec., f/5.6, ISO 100, 35mm. IT’S OFTEN DIFFICULT FOR PHOTOGRAPHERS, UNDER THE SPELL OF A CONCEPT, TO KNOW WHETHER THEY ARE MARCHING TOWARD SOME LOFTY QUEST or merely walking in circles, their foot (or their brain) nailed to the floor. Fall too deeply in love with a given idea, and you could cling to it, for comfort or habit, long after it has yielded anything remotely creative. You might be mistaking a rut for revelation. We’ll all seen it happen. Hell, it’s happened to many of us. You begin to explore a particular story-telling technique. It shows some promise. And so you hang with it a little longer, then a little longer still. One more interpretation of the shot that made you smile. One more variation on the theme. Maybe it’s abstract grid details on glass towers, taken in monochrome at an odd angle. Maybe it’s time exposures of light trails on a midnight highway. And maybe, as in my own case, it’s a lingering romance with dense, busy neighborhood textures, shot at a respectfully reportorial distance. Straight-on, left to right tapestries of doors, places of business, upstairs/downstairs tenant life, comings and goings. I love them, but I also worry about how long I can contribute something different to them as a means of telling a story. As staged as a Broadway show, Norman Rockwell’s idealized neighborhoods are still alluring in their appeal. 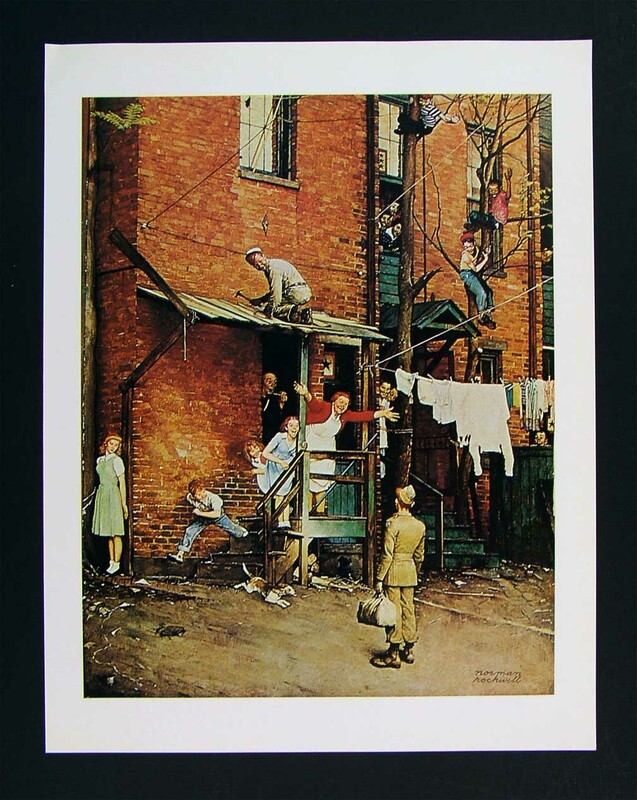 The bustling tenement neighborhoods of early Norman Rockwell paintings appealed to me, as a child, because the frames were teeming with life: people leaning out of windows, sitting on porches, perching on fire escapes, delivering the morning milk…they were a divine, almost musical chaos. But they were paintings, with all the intentional orchestration of sentiment and nostalgia that comes with that medium. Those images were wonderful, but they were not documents…merely dreams. That, of course, doesn’t make them any less powerful as an influence on photography. When I look at a section of an urban block, I try to frame a section of it that tells, in miniature, the life that can be felt all day long as the area’s natural rhythm. 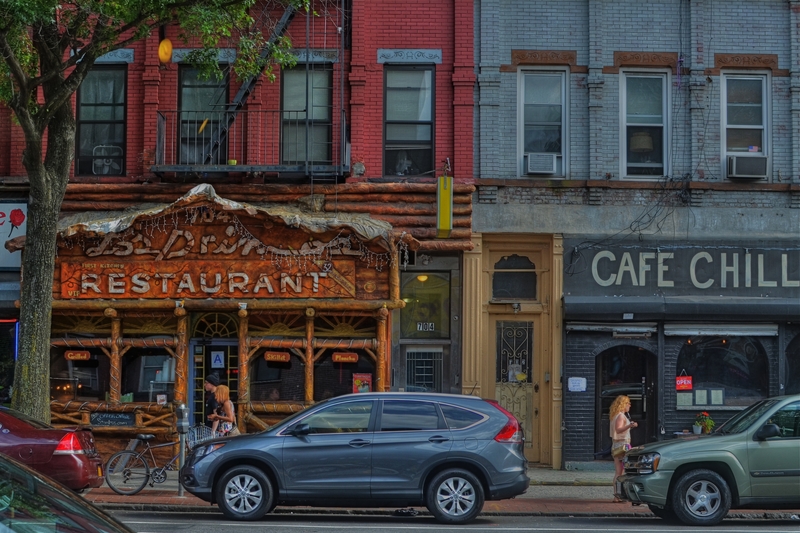 There are re-gentrified restaurants, neglected second-floor apartments, new coats of paint on old brick, overgrown trees, stalwart standbys that have been part of the street for ages, young lovers and old duffers. Toss all the ingredients together and you might get an image salad that captures something close to “real”. And then there is the trial-and-error of how much to include, how busy or sparse to portray the subject. That said, I have explored this theme many times over the years, and worry that I am trying to harvest crops from a fallow field. Have I stayed too long at this particular fair? Are there even any compelling stories left to tell in this approach, or have I just romanticized the idea of the whole thing beyond any artistic merit? Hopefully, I will know when to strike this kind of image off my “to do” list, as I fear that repetition, even repetition of a valid concept, can lead to laziness….the place where you call “habit” a “style”. And I don’t want to dwell in that place. This entry was posted on July 24, 2013 by Michael Perkins. It was filed under Architecture, Cities, Composition, Frame, Neighborhoods, Nostalgia, Street Photography, Urban and was tagged with City Life, Neighborhoods, New York, Norman Rockwell, urban. Great shot, Mike. I wonder if you find the showroom-shiney Honda CRV as distracting and counter to the mood of the image as I do? I agree that its inclusion seems a little against the grain. I was torn between taking my best shot at a real working street, containing several elements that I wasn’t thrilled with, versus passing on the entire scene. Orchestrating everything to perfection was a tool that old uncle Norman Rockwell had at his command, since his “subjects” were all posed models. But I’m with you on your general point. Thanks for taking the time to comment. Hope all is well.